Where can we order Vat dyes in Germany? Message: Hello and sorry for disturbing, we want to order Vat Dyes and didn’t know where. Can you help us? Vat dyes are not as difficult to find as Naphthol dyes (yesterday’s question). A good retail source for vat dyes in Europe is Granat Farvekompagniet in Denmark. Look for their page of Granat Kypefarver/Batikfarver. Vat dyes are not as suitable for beginners as Fiber Reactive dyes, but they are neither difficult nor dangerous to use, assuming normal safety precautions with safety goggles and gloves. The dyes are usually purchased in an insoluble oxidized form, and must be chemically reduced in order to solubilize them and get them inside the textile fiber; when the fiber is then exposed to air again, the dyes re-oxidize and become insoluble, so that the dye inside the fiber becomes fixed in place. Vat dyes are particularly interesting for printing on fabric that has been dyed with dischargeable dyes, such as Remazol dyes or most Procion dyes. The same chemicals that are used to solubilize and reduce the vat dye will remove the existing color from the dye on the fabric, allowing the brightness of the vat dye in your design to contrast sharply with the background color. Granat Kypefarver/Batikfarver’s range of Vat dyes has been especially selected for being suitable for illumination dyeing on backgrounds made with Fiber Reactive dye. Another useful property of Vat dyes is that most of them are less susceptible to fading than other types of dye. Not all Vat dyes are equally light resistant, but many are significantly more light-resistant than Fiber Reactive dyes or Direct dyes. A specialized category of Vat dyes is light-sensitive pre-reduced Vat dye, which can be used to make single-color photographic prints on fabric. There are two brands of this amazing product available, with slightly different colors. 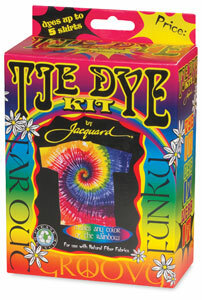 Jacquard Products makes SolarFast light sensitive dyes, in fourteen different colors, and Lumi makes Inkodye, available in nine colors. Unlike sun-printed fabric paints such as Setacolor, the light-sensitive dye does not change the feel of the fabric, and it wears better than fabric paint since the dye penetrates the fiber. 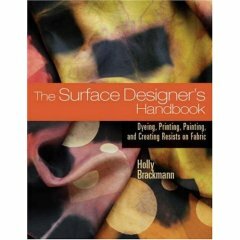 Since it is actually visible light that fixes the dye, rather than the heat from the infrared in sunlight as for fabric paints, inkjet transparencies with photographs or drawings can be used to make quite detailed designs. For more information about Vat dyes and their use, see my page “About Vat Dyes”. This entry was posted in sources for supplies, vat dyes on March 31, 2016 by pburch. Thank you so much for all those information about dyeing. I am looking for Naphthol dyes in Europe but it seems quite difficult to found them. I checked also the links your put on “where to buy dye & supplies” but nobody of them seems to have naphthol. May I ask you from where you get them? Thank you in advance for any further help or advice! I have never seen a retail source for artists and hand dyers to buy Naphthol dyes in Europe or North America. I have wondered whether this is because of their toxicity and ease of absorption through the skin. I believe that Naphthol dyes should be used only in a properly equipped lab, never in a kitchen or the sort of studio in which people bring in their lunch. You can order Naphthol dyes internationally from Batik Oetoro in Australia. I don’t know if there are any local restrictions on the importation or use of these dyes in Europe. Batik Oetoro does ship internationally. See the Batik Oetoro “Naphtol & Diazo” page. For more information about Naphthol dyes, see my page, About Naphthol dyes. If you do order these dyes, I would love to hear about your experiences with them. This entry was posted in naphthol dyes, sources for supplies on March 30, 2016 by pburch. I noticed in reviewing the supplier list that Max E B is no longer listed. I have tried calling the number I have for them but am having no luck. Do you happen to know if they are out of business? I am desperately searching for clothing blanks other than from Dharma and I have used Max E B in the past. Thanks for any info you may be able to provide. I removed Max E B from my online listing of Sources for Dyeing Supplies Around the World because their website (http://www.maxebonline.com/) disappeared. I suspect that this means that they went out of business. I’m sorry to say that I don’t know of any new alternatives. If you hear anything more, or if you learn of another source, please let me know! This entry was posted in sources for supplies on April 16, 2015 by pburch.